If you would like to recommend a new resource, get in touch. This report aims to help investors, intermediaries, and entrepreneurs better navigate the complex landscape of SGB investment in frontier and emerging markets. Segmenting the SGB market into multiple “missing middles” will help more effectively diagnose the distinct financing needs and gaps faced by different types of enterprises – and in turn, will enable the industry to better focus on scaling the financing solutions that are most needed to empower these enterprises to meaningfully contribute to inclusive economic growth. 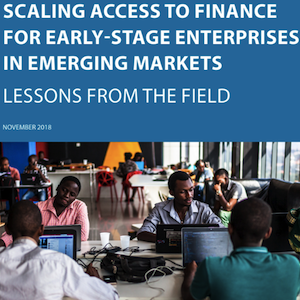 This report explores scaling access to finance for early-stage enterprises in emerging markets and shares lessons from the field. It seeks to explore how to improve the scalability and viability of early-stage finance provision in emerging markets, thereby reducing the need for philanthropic capital and subsidies to the local providers of finance and support to early-stage enterprises. This report explores 20 enterprises that serve people who are living at the bottom of the pyramid to better understand the impact, sustainability, and scale of these businesses. The research aims to help provide transparency and guidance to advance the broader field of funding for businesses serving the deep BOP. The study focuses on SMEs that are commercially viable with five to 250 employees and have significant potential and ambition for growth. Within this segment, our "Target Market" focus is on businesses in the “validate” and “prepare” stages seeking growth and working capital of between $250,000 and $1 million. 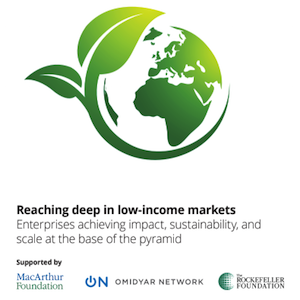 Omidyar Network and the Global Development Incubator conducted a study with 50+ fund managers, fieldbuilders, and other intermediaries to detail the size of the market for SGB investments, existing debt and equity structures and products, progress by local and international investors, and success factors. It includes recommendations for the sector based on the gaps identified in interviews. The handbook is a tool to foster the development of early-stage SME investment in Africa and encourage the rise of new investors on the continent. The primary objective of this handbook is to provide an operative document for the future investment companies of the continent, and is intended for investors, entrepreneurs and anyone interested in the field of SME financing in Africa. 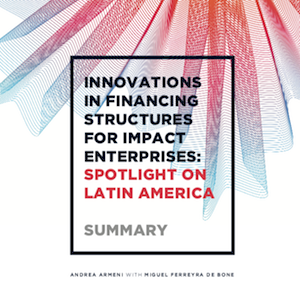 This report outlines the specific problems with traditional financing structure for impact enterprises, including how investment funds and deal structures are innovating to alleviate the capital gap, and recommendations for how fund managers, investors, entrepreneurs, and others can engage with these alternatives to collectively increase our impact. The report highlights 16 cases across Latin America. In search for new models to provide risk capital, mezzanine finance, which blends elements from traditional Private Equity (PE) and debt financing into a unique product, provides an additional offer in the SME finance ecosystem for missing middle entrepreneurs. This studyprovides an understanding of the specificities, diversity (and complexities) of it, critical to spur innovative thinking on both the fund managers and investors sides so products may be improved and models may be more scalable. EMPEA’s first in-depth look at the role that private credit plays in supporting the development of small- and medium-size companies across the emerging markets, and in offering institutional investors a means of accessing this growth.